While most of my favorite Mexican food is not so diet friendly (think cheesy enchiladas, greasy nachos), this salsa allows me to indulge in all the flavors I love, guilt free. The taste factor: The danger with most salsa is that I pair it with chips, then overdo it. But now I can fear not as I dip: This salsa may be light and fresh, but it also packs a spicy punch, making it easy (and satisfying!) to stop after just a few scoops. The health factor: At only 9 calories per ounce, it’s the ideal way to cure a Mexican food craving. Plus, the American Heart Association even endorses it for its low sodium and calories, and the fact that it’s fat- and cholesterol-free. I love that they don’t include any preservatives, too—the ingredient list is literally this simple: tomatillos, chiles, onions, water, salt, garlic, and cilantro. 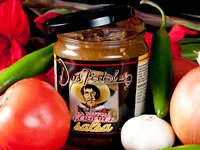 Why we love it: Making wise choices with Mexican food can often be a challenge, but Dos Pistolas salsa is as tasty as it is healthy. I liked it with a few baked tortilla chips to round out the perfect, zesty afternoon snack.